On your first ride, you want to make sure that you take it slow. Remember all of the torque from the engine is coming from your foot. You will want to start out in a large open area like a parking lot or school ground. Start the motor and let it warm up for a couple of minutes. Run the engine from idle to full power a few times with the drive wheel off of the ground. When engine returns to idle, put drive wheel back on the ground. With knees slightly bent, slowly add power by squeezing throttle lever. DON’T full throttle the engine on taking off! You will end up falling backward. Once you get going, you will need to stop. Be sure and ease off of the throttle your first couple of rides to get used to the drag of the engine compression and also the gears. After a few rides, you will be able to let off of the gas as fast as you want because you will know what to expect from the powered skate. To stop you simply point your toe up and push your heal down on the non-powered skate. This will activate the drag brake and stop you. You can also slow down by turning sharply from right to left, or hockey slide. These will come later. When you want to turn right or left on your rocket skates, you just put weight on either the left or right side of your feet. If you have ever snow skiing, it is similar to turning on them. However, once you are comfortable on your rocket skates you will find yourself throwing your skates back behind the other and railing hairpin turns this way. You will see that turning one direction will be easier than the other. So make sure to practice turns in both directions. You don’t want to be on a ride and find yourself in a situation where you need to turn abruptly and not be able to because you had not practiced turns in both directions! Just remember to look for the other guy and to leave yourself plenty of space to allow for any problems ahead of you. 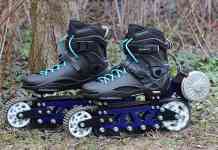 If you find that you are experiencing speed wobble on your rocket skates try adjusting the buckles on the boots. First, loosen them and see if it helps. If not, then try tightening the fasteners. Once you find the right adjustment on your boots, take a permanent marker and mark the spot on the buckle and then you could get the correct alignment before each ride. Always wear all safety gear when riding your RocketSkates.